This Rotary men's timepiece features a 40mm stainless steel case with bubble mineral glass, a silver dial, applied index markers and a date window at 4/5 o'clock. It is powered by quartz movement and water resistant to 50 metres. 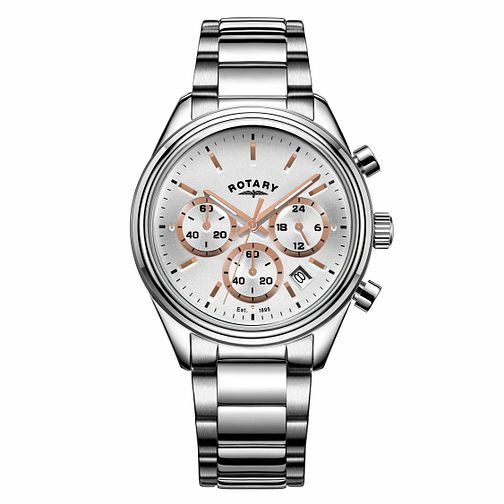 Rotary Men's Stainless Steel Chronograph Bracelet Watch is rated 5.0 out of 5 by 2. Rated 5 out of 5 by Anonymous from Great Excellent watch and excellent brand. Very good looking and comfortable. Rated 5 out of 5 by Anonymous from Good quality watch Really great functionality and good looking watch.